Metal Craft has manufactured most of its own dock products since the company began in the 1930’s. Our accessory items are extruded aluminum; many of them from proprietary dies and fabricated to work with our interlocking deck design. Many accessory items such as the 3-person bench, mooring cleats, bumper brackets and even the swim & safety ladder were manufactured in bulk by the previous owner providing us ample stock season to season. In May of 2015, accessories were in high demand exceeding our projected sales for the year. Metal Craft realized the current inventory levels of these items was not going to last another full season. We immediately began fabrication of the 3-person bench which took nearly 6 weeks to complete causing many back orders and shipping delays. When it was time to fabricate the swim & safety ladder, Metal Craft faced another challenge – how many ladders were we going to make, just how long was each one going to take to fabricate and where were we going to store them? We found fabricating a ladder was a painstaking process. We quickly realized our process was outdated and immediately reviewed our supplier options. The dock ladder offering was re-evaluated and we contacted ladder suppliers solution to our ladder concerns. For the 2016 season, we are happy to offer three ladder options for our customers; the 4-Step Swim Ladder, the Hinged Dock Ladder and a Retractable Lift Ladder. The 4-Step Swim Ladder is a stationary or fixed position ladder great for seawalls and stationary docks. The Hinged Dock Ladder swings upward when not in use and secures with quick-release safety pin locks. It also works well on seawalls and stationary docks. 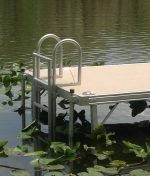 The Retractable Lift Ladder slides above the water line and has a double ring locking mechanism for securing and is perfect for stationary and floating boat docks. We’re confident one of these three designs will fit your dock ladder needs! It wasn’t enough to select just anyone to supply our new dock ladders, quality product and excellent service were key. We are pleased to say the new ladders offer the same great quality that our customers have always known from Metal Craft, while affording a lesser price for the 4-step Aluminum ladder which is very comparable to the former Metal Craft Swim & Safety Ladder. Each aluminum dock ladder is constructed from 6005T-5 anodized aluminum with no-gap welding and will accommodate up to 750 lbs. The step width is 2” with grooves to ensure secure footing and prevent slippage. We are excited to offer this new line of aluminum dock ladders for 2016. If you need a new ladder or are interested in more information about dock ladder options, contact an authorized Metal Craft Docks dealer today!